The Lanier Theological Library is a research library that welcomes all who abide by library policies and use its resources respectfully. The Lanier Theological Library is a growing resource for all students and scholars of the Bible in Northwest Houston. Within the library, you will find a comprehensive collection of books, periodicals, historical documents and artifacts with topics ranging from Church History and Biblical Studies to Egyptology and Linguistics. The LTL regularly hosts events with noted authors, guest lecturers and researchers who will challenge you both academically and spiritually. Come to the Lanier Theological Library and find serious tools for serious study. Click here for a map of the library and an information sheet. Because the LTL is a research library, we do not allow books to be removed from the building. Please respect the needs of others for a quiet setting in which to read. Lower your voice and silence your cell phone. Q: Is the library open to everyone? A: Yes, the library is open to all, whether you are a scholar, student, or layperson. We welcome children to tour the library, but not to stay here while parents study. Children 12 and under must be accompanied by an adult at all times (1 adult for every 2 children). Q: When is the library open? A: The library is open 9:00 a.m. – 5:00 p.m. on Monday – Friday, except for Tuesdays when we are open from 9:00 a.m. – 9:00 p.m.
Q: Do I need to make an appointment to visit the library? A: No appointment is necessary during our regular hours. Please note that our mailing address is different. Q: How do I enter the library? 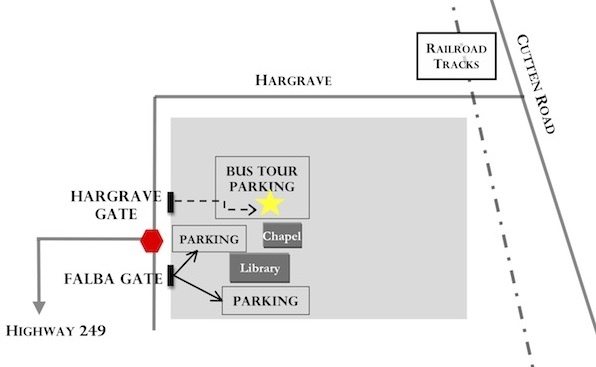 A: Please come to the Falba Gate (see map) and use your cell phone to call the library’s main number, 281-477-8400. We will open the gate for you. You may park to the right or the left after entering the gate. Q: Is there a registration or enrollment process for patrons? A: Yes – upon your first visit, you will register with a photo ID and give your email address, phone, etc. In subsequent visits, one of our staff members will only need to know your name for sign-in purposes. If you are here just for a tour, you do not have to register. Q: How can I see what books you have at the library? A: Please click here to access our library catalog, which is a search engine for all the cataloged books in the library. We always have more books which have not been cataloged yet. Q: May I check books out of the library? A: No, all books must remain in the library. Because we do not check out or loan books, we have two copiers with scanners (see map). Please limit yourself to 10 copies per visit without special permission, but you can scan pages and take them with you on a flash drive. We can sell you a flash drive for $5.00. Q: What do I do with my books when I’m finished with them? A: Please place them on one of the designated return carts. Do not attempt to re-shelve the books!